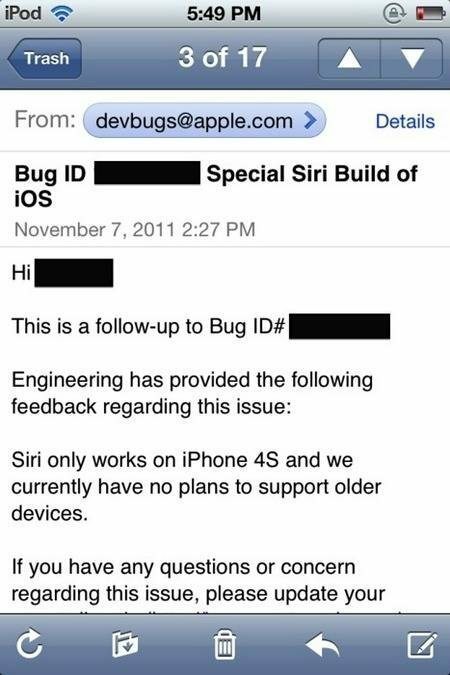 A couple of days ago the word was Apple was testing their Siri voice assistant on other devices, which was presumed to be the iPhone 4, which would have meant porting Siri to older iOS devices wouldn’t have been left to the hacking community. However, it appears that Apple currently has no plans on bringing Siri to anything other than the iPhone 4S. According to an article over on 9to5 Mac, Apple has now confirmed that the Siri voice assistant is exclusive to the iPhone 4S and has no plans to deliver Siri to any other older iOS device. Thus it would appear that if you own an earlier iOS device and hope that Apple will deliver Siri to that device then for now at least its not going to happen. That doesn’t mean though Siri wont come to older device without Apple approval, as I am sure the hacking community will now be throwing efforts to deliver what Apple wont. We have already seen a video of a Siri port to the iPhone 3GS as reported by my colleague Mark, and no doubt sooner or later the hackers will fully accomplish the task on other devices albeit requiring you to jailbreak your device.